Much more than a moody, atmospheric vampire film, American filmmaker Ana Lily Amirpour’s feature film debut, A Girl Walks Home Alone at Night is a Becket-like creation, and one that’s full to brim with dark tableau and an effulgent frame of mind. In Amirpour’s own words she describes her film as an “Iranian Vampire Spaghetti Western”, and the largely nocturnal, artfully anamorphic black-and-white world suggests its denizens exist in and another time altogether. This incorporeality is lifted in part by the cast of unconventional characters––from heroin-addicted patriarchs, haughty, drug-dealing pimps, an expressive, chimera-like cat (occasionally confused with a dead wife), to the chador-clad vampire herself––who speak spare and often idyllic dialogue in Farsi (with English subtitles). Set in a place called Bad City, an apocryphal Iranian interurban deep within the recesses, it’s a despotic place fringed with ominous oil fields that draw oil like sanguine fluid from the earth, and where a canal filled with corpses, like a cold-shouldered sepulcher, reminds the citizenry that any of them could be next in so massive a grave. In this climate of fear and flesh a lonely vampire lives amongst them. Sheila Vand (Argo, Whiskey Tango Foxtrot), in a role that Amirpour wrote specifically for her, plays the eponymous vampire with glow and discretion, adding to the obliquely effective emotional landscape at the crux of this unfamiliar and oddly romantic new mythology. To see Vand in a traditional chador, itself a delicious and dry remembrance to Dracula’s diabolic cape, as she moves through the desolate streets of Bad City, is to see a new iconography; it has the feeling of newfangled folklore––particularly when she’s on a skateboard. Vand, who displays both human and vampiric offset, does satiate her vampiric appetite on many occasions, and fearsomely, but she also shows tenderness towards Arash (Arash Marandi), a personable punk with a shiny sports car à la James Dean. A scene where he pierces her ears and pins jewellery to them is especially enamoring, for it’s nothing I’ve ever seen in a vampire film before, and something about Vand’s inexorable grace and offhand gaze underscores her defiance to be an undead shibboleth; for she is frequently shown in this film to be something neoteric and ferociously contemporary. “Are you a good boy?” she asks a neighborhood street brat who, like her, is walking the ill-lit alleyways late at night. It’s a brilliant, chilling, and incidental moment in a film that’s made of many such unnerving and ingenious flashes. Also unique to A Girl Walks Home Alone at Night is Arash’s expressive and rather rotund cat, Masuka, who gets his share of sumptuous close-ups, too. In fact, I’ve wondered over a few subsequent viewings if it isn’t Masuka, and not Arash, who is the film’s proper eye, the one who’s point-of-view we identify with and who’s estimation we forcibly share. From the film’s opening scenes we meet Masuka –– he’s stolen by Arash, and becomes his pet just as the story launches –– and the final scene of the film presents the feline’s full gaze, directly to camera. Could this be Amirpour’s intention or just a fluke? Consider also that cats, like Vand’s vampire, are night-loving hunters. And the vampire is quick to mete out retribution and annihilation to both Hossein (Marshall Manesh) and Saeed (Dominic Rains), who both disrespected and were ruthless towards Masuka. And to follow this line of thinking just a little further; a cat’s vision is less sensitive than our own, as far as a color spectrum is concerned, it’s not black-and-white at all but the monochromatic lensing of the film does make for a suitable simulacrum of the cat’s eye consciousness. Maybe Masuka does command our eye, after all? It’s playful to consider, at any rate. Cinematographer Lyle Vincent’s black-and-white photography is palatial and ethereal, adding to the otherworldliness that Amirpour has so artfully and carefully construed, underlining the narrative and visual symmetry, and antes up feelings of existential ennui. The often abrupt, rock shelter-like visuals combine with the listless sound of the wind and a pleasing post-punk soundtrack that sharply stings, adding up to one arresting and exquisite accomplishment after another. 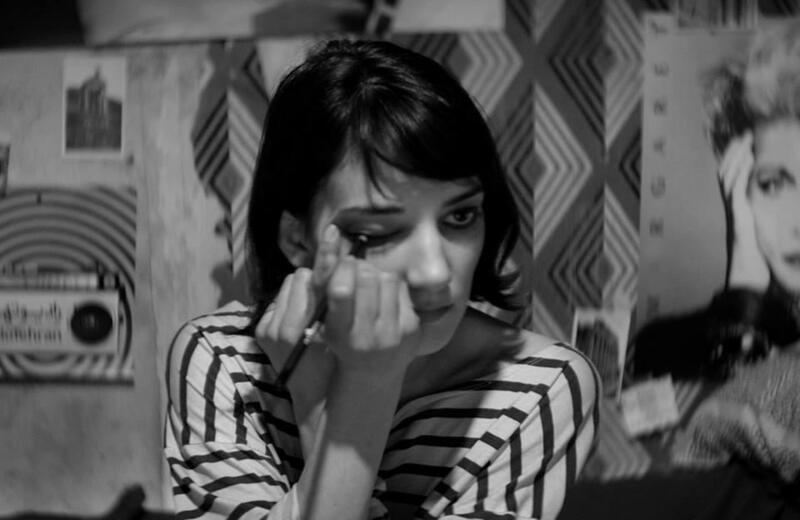 There’s a fresh, undisciplined and unhurried quality to A Girl Walks Home Alone at Night that does draw comparisons to both the spontaneous-feeling early work from Gus Van Sant (1985’s Mala Noche in particular), as well as Jim Jarmusch during his melancholy monochrome period (1984’s Stranger Than Paradise and 1986’s Down By Law) but with the feminist foundation and the fangs of Only Lovers Left Alive (2013), and certainly with the slyly humorous drollery and neo-noir animus of these, and yet Amirpour moves beyond any kind of pastiche or genuflection. She is energetic and expressive in ways that are very much her own. At once vulnerable and vengeance-fuelled, A Girl Walks Home Alone at Night leaves teeth marks that won’t fade for days, leaving a bite that’s arrestive, tantalizing, and dangerously tempting.